greeneyes2: Crab Shell Powder is specifically for Reversing work. I do use salt (with additives) in a lot of my candle work, but not ever for reversing work. These ingredients are definitely not interchangeable in the least. I guess my thoughts were about encircling the perimeter of the area ..almost like focused area when sending bad back. I would still say that Joseph's advice is sound. If you don't have crab shell powder, then you can use Reversing sachet powder. I was burning a black over red reversing candle on a mirror with crab shells around the candle. Well the mirror broke at the end of the candle burning and burned all the way down to my dresser! Can someone explain to me what this means because I have burned several of these candles and this has never happened! Also what do I do with the remains of the broken mirror because all the candle was consumed except a very small piece? PLEASE be careful when working with candles. Always light in a safe place and ALWAYS be prepared for accidents to happen. I am so sorry that it burned your dresser. That's a shame. I've been reading the reading from the list of workers you all have listed. You guys have so many it makes it very hard to choose!! I don't think I saw your name on the list so do you do any reading or work? I really do need some help I am going through alot of stuff right now and it's not with a man. I have been ordering from you guys for awhile and I like the products but I know that what I am dealing with I need some professional help to beat this thing because I am working against a professional physic attacker! Hi, just join, I have to uncross myself from some powerful black magick,and do a reversible ritual, I usually hear that the size of the candle does not matter, but I not sure with double action and reversibke candles. does it matter if I use 6" or 9" double action candle? which one is the recommend one? which size should I choose? do I perform the uncross spell first, then do the reversible one? or do the reversible spell first? I do not think that the size of the candle matters. Either size will work, but since you mention that you are dealing with powerful magic being thrown at you, I would opt for the bigger size. Do the uncrossing first to get the bad juju off of you, then do the reversal work to send it back to its source. You might think about doing some aggressive protection work as well to prevent the nasty juju from hitting you again in the future. In fact, I highly recommend it. Fiery Wall of Protection products are awesome. St. Michael the Archangel is a powerful protector. You can blend these two product lines together for some serious protection. 1. since you stated that because my situation seem to be pretty bad, you suggest that I use a jumbo one, do you mean bigger candles work better, and more powerful, or does it go by times, in which is the bigger the candle the more burning times for the spell? 2. if I am crossed in my life real bad, that many time wishing to be dead, now I am trying to uncross myself. can I just do cleanning and banishing bath and reversing candle spell without uncrossing candle spell? 3. can someone been uncrossed just by doing reversing candle spell, with double action candles and of course ritual bath? 4. if reversing spell is to send back the curse to it origin, that is mean that the curse is not there any more the victim is heal, then there is no need to do any uncrossing works, right? 5. is reversing candle spell is to send back the curse and out from the victim or is it just a work to make the sender taste the same pain, but the person is still cross? 6. can double action and reversible candles use for uncrossing spell? I am confused about them. I am new in candle magick, I never get any where until my parent told me to pray with candles , then I feel a little bit better. now I am trying to help myself. 1. Any candle is better than no candle. A bigger candle has more burn time - that's the important part, not the size nor ''power'' of the candle itself. Several small candles burnt over a series of days can be just as successful as can trading in a free-standing taper for a Reversing Vigil light. They're different ways of working and which is best has more to do with how you like to work (or were taught) than on any of the methods being more successful than the other (they all work). 2. If you are ''many times wishing to be dead'', it's important to get psychological support in addition to any magical work you may do. Being suicidal is a serious psychological condition which needs to be addressed in the mundane world as well. Please call a support line and see a medical professional to ensure you are receiving the care necessary to your condition. I would perform uncrossing in conjunction with any reversing work you do. The uncrossing spell kit is the most complete kit for that and can be found here: http://www.luckymojo.com/spell-uncrossing.html (as you'll see, bathing/cleansing are an important component of the work). 3. Depends on their situation. 4. Generally Uncrossing will be done nonetheless to get rid of the ''residue'' from the previous sender's works. Think of it this way: if you've been in a mud pit for a week and you climb out of the pit and throw in the person who put you there, you're still dirty (although no longer in the pit). You'll have to wash if you want to get clean. Uncrossing work is that ''washing''. 5. Sends back the curse. Return to sender. The original target is no longer crossed, but see the explanation in 4. above. 6. No. Not the same spell or purpose. Thank you Aura for your simple and elegant responses to danoo's questions. I love reading your posts! Oh wow!! Thank you so much Aura, your explanation is very clear and helpful. I will look for further help. I have a question, and I'm not sure if it has already been addressed previously. Earlier this evening I began to burn a green/black 6" double action candle. The candle was butted and I carved out the wick on the black section. On the black section I carved "my enemy" in reverse as I don't know of a specific person. On the green section I wrote my name normal (not reverse). I anointed the black section with reversing oil, and the green section with money drawing oil. After the candle had began to burn I had a strong/steady flame, however I noticed it started to slightly burn on one side with a thin line allowing the wax to burn down the side. I realized this could be due to an uneven wick so I decided I would give it sometime and check back to see how it was burning. When I checked back a little bit later the flame had remained the same burning strong/steady, but an image of a face had appeared on the side of the candle where the wax had dripped. Also, the wax was no longer burning down the side. I took a picture of my candle and sent it to my friend. I asked her to look at the picture (without giving her any details). My friend also said she seen an image of a face on the side of my candle; eyes, nose, lips, chin. This is the first time I have seen this so I'm not sure what it means. Can anyone give me some insight on this? Usually when you see a face, there is usually other symbols around indicating who this person might be. There may even be an initial. I would light another one. Thank you for your response. I finished burning this candle but didn't see any further signs, however I am pretty sure I have some obstacles to over come (I'm working on this). I will burn another candle and see what results I have. I have a question about a double action candle since I have no experience in working with these. Obviously I started burring its black part first and it was going well for about five mins the black wax poured over the edge and down over the red bit of the candle (perhaps the wick was too close to the edge?). At the same time a glass dish I placed over an oil burner broke into pieces but that again could be the heat and the dish I used was a normal candle dish so perhaps too thin. Anyway no more wax poured down the candle but I think it's burning way too slow - is 5mm per 2h a normal melting time for these and I'm just being paranoid or is it really a stubborn spell I am trying to reverse and should try again after this one burns down (hopefully!) completely? Yes, I would definitely do another one. I have a question. Would it be appropriate to add something like Confusion or something hexing to the black side of the candle (against your enemy) & dab on something like Van Van on your side of the candle while performing this spell? Are you talking about a double-action candle and not a reversing one? If so, then dressing the different colors with appropriate oils would be right, but you can't do that with a reversing candle. Please let me know if you are talking about a double action candle or reversing candle. I need to move this to the correct subforum and to answer you correctly. Sorry, I meant a double action candle. Thanks for your answers, ladies. I'm rethinking this direction & actually even naming one specific enemy in general. I did do a reversal burning, but since then it all the times that I have been blocked in love by opponents is crossing my mind. I really think I should do a general Reversing against those that have harmed my love life (in adulthood). I'm not a revengeful person, but moving on when you've been maliciously spoken against by back stabbers that were supposed to be your family is hard. I think doing a Reversing this way will help me to finally unblock my love energy & move on with my life. On the double dipped Reversing candles; are both names written in mirror writing or is it just the person you're sending it back to? AlyssaH, what do you mean by "double dipped Reversing candles"? We have nothing among our 5,000 products with the word "dipped" in the title. We sell Double Action Candles in three colourways and Reversing candles in one colourway. 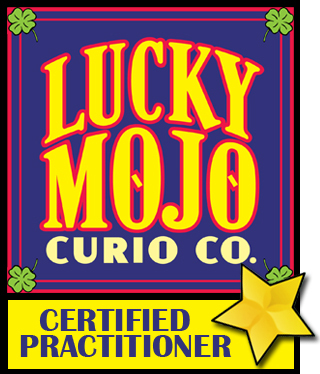 Once you tell us which Lucky Mojo candle you mean, i can reply. Oh no! How did I lose this thread??? I meant the Reversible, I went ahead & did the mirror writing & sent it back to "My Enemies," to be on the safe side. Hello everyone I have gone through this whole thread and I can't seem to find what I'm looking for. I am ordering the jumbo reversing black over red candle as it seems to reverse all bad luck, which I would assume means bad luck in love, money and health. In the Art of Hoodoo Candle Magic book, it states that when using the black over red reversing candles, all the names are written backwards on the candle. So am I right taking it to mean that not only do I write my enemy's name backwards but also my own ? Secondly I know that I annoint the reversing oil away from me when I pray for all my enemy's bad stuff to be taken back to her....but I'm a little confused... I also wish to draw all the good that has been taken away from me, back to me. Do I annoint the candle towards me as well with reversing oil whilst praying for all the good to return to me? It's a bit tricky since the black is all over the red:( . 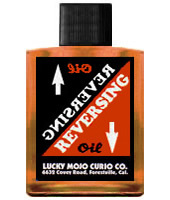 The way I understand reversible candles to work is to use them against your enemy(s) with carving their name backwards and anointing with Reversing oil (http://www.luckymojo.com/reversing.html). I would not put my own name on a reversing candle the way you do with a double action candle. I hope this helps! Thank you Nathen yes I was a little confused when I read that and definitely wasn't going to carve my name on the black unless I knew for sure. I'm still a little unsure as to where my name goes on that candle so that all the good is drawn back to me. Maybe it doesn't work that way. Unfortunately there isn't much info on those candles. I'm thinking maybe I will burn three of the double action candles, one of each colour. Quick question: would sending back the troubles a person caused you with a double action candle dressed with clarity oil as well as reversing be a valid way of working? I don't want to harm them, just send back the mess they caused and open their eyes to what it's done. They used to be a very good friend, but their actions and words caused me considerable emotional distress and I don't just want them to feel the same, but realize that they were wrong. When I first read your question my gut reaction was to say no don't add Clarity to the Reversing oil but just to make sure I double checked with another rootworker and they confirmed it. That isn't necessary and probably would not really work like that. Just use the reversing oil and mention in your prayer or petition that they know and feel what they have done. The Reversing products will take care of all that on it's own. Really, as soon as I thought it, I kind of figured it was not something that I should do, seemed like maybe it would work at counter purposes with each other but being a newbie I wanted to be sure. Thanks for verifying, much appreciated. What do i write on the candle ? My ex hurt me a lot, broke me every chance he got and I want him to feel what I felt, how would I do that? I read on someone on here that they did that but I PM'd them and had no answer. Can someone let me know? What do I need to buy? I am so sorry that your ex did this to you. What a jerk. There's so much you can do. You can do uncrossing; jinxing; double cross; destruction; cursing, revenge, etc. Just go to the upper right hand corner of any page. In the dark green area, there's a white search box. Type in one of these words (just one word per search) and you will find a zillion spell ideas. Wishing you success with your revenge. I started a double aciotn red/black candle spell for uncrossing and removing negative beliefs I have around love on the night o the full moon last Saturday. Where I was I was unable to continue the spell or 13 days straight and stopped on the 3rd day. Now that I am back home I want to do it over. Should I use a new candle i so, how should I dispose the partially burned one. It was to be re-lit every night I took a bath. Thank you for any advice or help. I would start a new one. What is the meaning if the black part of the candle wax drips down into the red while it is lighting? I am sorry but we do not interpret things like this on the forum. I think I just messed up my second double action candle and only had 2 pink and black on hand. Trying not to get discouraged my head hurts lol. It's the black part I keep on messing up. If you can read it in a mirror, then you did it correctly. Try practicing by writing it on paper first and then check it out with the mirror. If it's OK, then you are ready to start! I have split, moved and merged your post to the correct area. Is there any special instructions on how to burn a red and black glass encased reversible candle?? Hello, I want to know if anyone can inform more about the the "Black over Red" reversible candle. What are the side-effects that occure when someone prepares & lights up this candle once it's send to their enemy? What would happen to me if I light this candle written with the full name of my enemy? I've been told that this is a powerful candle, I want to be fully aware that it won't affect my karma. Can anyone please share with me their experiences what happened after lighting this candle? I want to be sure before making a decision I'll regret. I am new to LM ! And looking forward to learning new things on this forum l. Please bare with me because I am sure I'm doing something wrong LoL. I have been given some information about my case from AIRR rootworker and I can't wait to get down to business. I want to gather as much information as I can before starting my work. I have everything else down pat eg. Baths, teas, oils etc BUT the candle bit. I want to do uncrossing/spell breaking work WITHOUT reversing it?...I tried to look it up but didn't find much. After or during my bath I would like to use a candle. Which should I use black, grey or double action? Can I get the 6" for my home and burn it all day? If I use the double action, should I dress the black with uncrossing oil and the white with blessing or fiery wall of protection? If I use double action candles what can I carve on the black side if I'm not reversing it...eg. "Uncrossing the evil doings" and white side my name ? Just so that you know, we ask that you do not start new topics. Just find the thread that most applies to your query and hit the "reply" button. There's this randon site I came accross that said reversal spells are even more dangerous than curses. Plus they should only be done if you in danger. I don't see how that's true because first of all reversals do is send back to someone what they sent your way, and they're not punitive. Curses on the other hand, do the opposite, and are punitive. But is that true that reversals are more dangerous? I've doen a couple reversals to send back negativity, and jinxs I believe people put on me, and my family. But all I want is to send back what they sent our way, I don't want to harm them. I'm what people call a "white witch", and practice white magic only. Just wanted to get some clarity on the Jumbo Reversing candles. I know the Double Action candles send all the crap back to your attacker and then brings in good luck to you. I got the Reversing candle because I needed to reverse multiple forms of bad luck (I didn't know the Double Action red and black candle could be used for this otherwise I would have gotten that one). What I want to know is, does the reversing candle just reverse the nastiness? So I'd have to do some good luck drawing work separately? Yes the Jumbo Reversing candle is for reversing things back to your target. If you want to draw in good luck for yourself, you would need to perform that as a separate spell. Thank you very much. That's pretty much what I thought but I wanted to be sure.